After his ship goes down, Edward Parker is rescued at sea, but when he gets into a fight with the captain of the ship that rescued him, the captain maroons him while making a delivery to the tiny tropical island of Dr. Moreau. Moreau is very secretive, and Parker discovers why. The doctor is a whip-cracking cruel task master to a growing population of his own gruesome human/animal experiments. Only the beautiful Lota appears truly human … but she shows signs of her panther ancestry. Parker’s fortunes for escape look up after his fiancee Ruth finds him with the help of Captain Donohue. But Dr. Moreau has violated one of his own laws, and his bestial creations will hold him to account! That sentence, in a nutshell, contains the motivation for Dr. Moreau. Having been driven from London by reason of his unethical experiments — using surgical and chemical means to attempt to duplicate Darwinian evolution on animals, and turn them into men. He’s failed in the attempt, and on his island, his failures live in their own village, held in control by their memory of “the house of pain” — the surgery when Moreau does his work. Beasts (in unison): Are we not men? Sayer of the Law: You! You made us in the house of pain! You made us… things! Not men! Not beasts! Part man… part beast! Things! 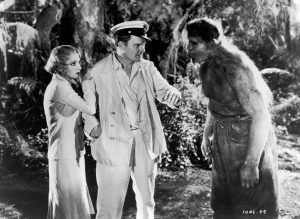 In short, The Island of Lost Souls is frankly excellent, with great acting by Charles Laughton and Bela Lugosi, and very good acting by everyone else. It’s arguably the best film version of H.G. Wells’ Island of Dr. Moreau made to this point. I rate it 4 stars out of 5. When you’ve got Charles Laughton and Bela Lugosi, how can you go wrong? Shipwreck victim Edward Parker (Richard Arlen) is stranded on an island run by the mysterious Dr. Moreau (Laughton). Moreau is hospitable enough, but the jungle is full of menacing shapes–and what about those ominous references to the House of Pain? Parker gradually learns of Moreau’s unholy experiments and worries that he’ll never escape. Though it has aged a bit, Island of Lost Souls is surprisingly spine-tingling, particularly the horrifying climax. 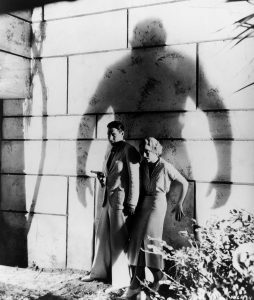 A twisted treasure from Hollywood’s pre-Code horror heyday, Island of Lost Souls is a cautionary tale of science run amok adapted from H. G. Wells’s novel The Island of Dr. Moreau. 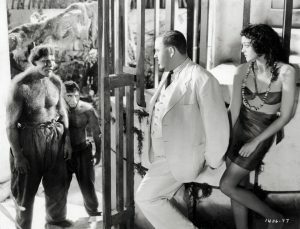 In one of his first major movie roles, Charles Laughton (The Private Life of Henry VIII) is a mad doctor conducting ghastly genetic experiments on a remote island in the South Seas, much to the fear and disgust of the shipwrecked sailor (Richard Arlen) who finds himself trapped there. This touchstone of movie terror, directed by Erle C. Kenton (House of Frankenstein), is elegantly shot by Karl Struss (The Great Dictator), features groundbreaking makeup effects that inspired generations of monster-movie artists, and costars Bela Lugosi (Dracula) in one his most gruesome roles.